I think most of us wish we had the Perfect Diet or the perfect way of eating that would keep us thin, fit and healthy. The problem is, there is no perfect diet, and thinking there is will likely result in consistent feelings of failure and disappointment​. Living in black and white thinking and all-or-nothing thinking are two examples of wanting to be perfect with our eating. Boy oh Boy, do I remember those days. 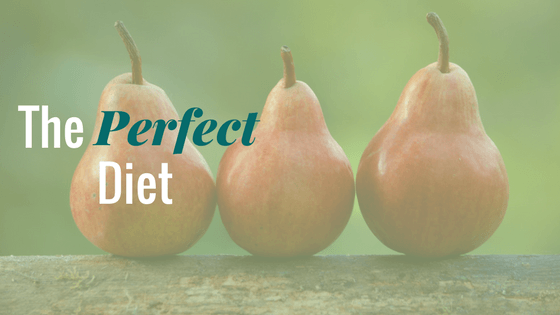 Yep, I admit it, I'm a recovering perfect eater who was in the search of The Perfect Diet. I thought having the perfect diet would be the answer to all the issues I was facing with food and my body. Little did I know that it kept me stuck in a vicious, yo-yo cycle for years. Anytime I would get off track, or not eat "perfectly," I would consider myself a failure, and throw all my healthy eating efforts right out the window. I'd take a huge (not intentional) pendulum swing to the other side and go off the rails. Can you say cupcakes?? And shame....? You see, there is no such thing as a perfect diet. There is no such thing as being a perfect eater. ​Th​inking that there is will set you up to feel a whole heckuva lot of frustration, disappointment, restriction and ZERO balance. It's hard to know why we behave this way with food. Sometimes it's linked to weight loss, sometimes it's link to body image, sometimes it's linked to wanting to be healthy. Most of the time, it's linked to needing to feel a sense of control in our lives over something. ​You see, growing up in an alcoholic home resulted in me feeling as though I needed to always control my surroundings, my food, my body, my relationships, etc. I never felt safe. I was always scared. I never knew what was coming around the corner. So, to cope, I turned to food and did whatever I could to control that. But, the problem was that I was also at war with my body, so trying to control my food and eat perfectly was a HUGE detriment to me. In my early years, I literally had a top dresser drawer full of candy that I would secretly eat behind the closed doors of my bedroom. (You can read more about that here.) That made me feel good for a while, but it didn't last long because then I turned 12 and realized my body was changing, and that took my issues with food to a whole other level. Now, I wanted to control my food so that my body would look a certain way. I strived during my teen years, and well into early adulthood looking for The Perfect Diet that would promise me all the results I wanted; a thin, perfect body and optimal health. Because I thought that was where happiness resided. But happiness didn't reside there. The only thing that resided there was misery and suffering. And I spent over 20 years stuck in the cycle of restricting, dieting, creating food rules, binge eating, emotional eating and starting over every day before I was finally able to heal and let go of my very unrealistic need to eat the perfect diet and have the perfect body. So, I felt I must share the ways I navigated this tricky terrain, and some of the steps I took to heal and come to a healthy, balanced and free place with my eating and my body. ​Make a list of all the rules you have around food. Every single one. ​Choose one of those rules, the one that feels the easiest to let go of, and tell yourself you are going to practice letting it go for the next 5 days. Every time you catch yourself wanting to believe whatever you tell yourself about that food, say out loud, "I'm letting that go...." Observe what happens. Food rules keep us stuck. They are loaded with judgement which is shortly followed by shame. We can never feel successful if we have a ton of food rules that we aren't able to follow. Often when we let go of the tight reins we have on certain foods they lose their pull, meaning it's very possible we might not want it as much ​when it's no longer forbidden. You get the idea. Shift the word perfection to permission. I know you might be thinking that if you give yourself permission you will go off the rails, or get out of control, and it may feel that way at first. Once you give yourself permission to eat something WITHOUT JUDGEMENT, you will have a whole different experience, I promise. It's the judgements that create the most suffering. And the judgements are all tied to the Food Rules I talked about in Step One. Whenever you judge yourself for what you ate, how much you ate or your actions, it solidifies it into your brain even more. Our brains feed off of negativity, and once we go there, it's hard to get out. Once you let go of a rule, and allow yourself to have that food with FULL permission and NO judgement, I guarantee that food won't have as much pull or attraction for you when it's no longer forbidden. Try it and see what happens. Once I let go of my rule around not allowing myself to have cupcakes​, I had a cupcake, and guess what? I didn't even want it....it lost all it's "sparkle." ​Check in with your Body. So many of us are completely disconnected from our bodies and what they need. We get ourselves into trouble by listening to our minds, which will often not make ​the best most optimal choice. ​Sadly we all-too-often listen to our minds ​which will usually overrule the subtle sensations of the body. Our body, at it's core, wants to be healthy and balanced, but our mind, behaviors and patterning have different ideas for us. You can break these patterns and behaviors that have been ingrained for a long time, you have to do it in the moment, consistently by making a different choice then the one you've always made. By connecting to your body each time you go toward food, you will start to shift this pattern and eventually break it. ​Needing to be perfect in any sense of the word is detrimental to our self-esteem and well-being. Perfectionism keeps us stuck and disconnected from our authentic truth. It also keeps us distant from others; it creates a suit of armor around us. ​Let yourself be OK with not being perfect. Remove the judgements, cut yourself some slack and give yourself permission to start living in a way that feels authentic, joyful and connected. ​Try out these 3 awesome steps and see what starts to change in your relationship with food, and yourself. Give up the need to have the Perfect Diet and see what your body chooses instead. I think you will be pleasantly surprise. And always know that you are doing your best, no matter what! Check out my video below to hear my Whoopie Pie Story and how I was stuck in Perfect Eating for years.